Local recreational anglers gathered at the Virginia Institute of Marine Science in Gloucester Point last week for an annual workshop to kick-off the 20th year of the Virginia Game Fish Tagging Program. A cooperative effort between the Marine Advisory Services Program at VIMS and the Saltwater Tournament Program at the Virginia Marine Resources Commission, the VGFTP was created in 1995 with the overall goal of training and maintaining an experienced group of recreational anglers who volunteer their time and effort to tag and release their fish catch. During the annual workshop, VIMS Marine Recreation Specialist Susanna Musick—who has served as the Principal Investigator for the VGFTP since 2010—welcomed the anglers to VIMS and discussed some of the overall goals and objectives of the program. Musick explained that the VGFTP requires its volunteers to only tag 10 species—cobia, spadefish, red drum, sheepshead, summer flounder, black sea bass, grey triggerfish, black drum, speckled trout, and tautog. “We tag these particular fish because they are recreationally important and there aren’t any other programs specifically dedicated to them,” she says. 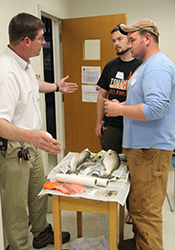 During the workshop, anglers were taught proper fish handling and tagging techniques, procedures for accurate and efficient reporting of tag events, and the goals and philosophy of the VGFTP. The workshop also provided the opportunity for the anglers to practice inserting tags in fish and to clarify any questions they had about proper tagging techniques. The workshop is a requirement for all new volunteers. At one station, instructors Ken Neill and George Wojcik showed taggers how to apply a stainless steel dart tag used on larger species like big red drum, black drum, and cobia. At another station, instructor Carl Stover gave new taggers some tips on how to access their tagging data and subsequent recaptures online. New taggers also practiced measuring fish according to VMRC guidelines for recording total length. At the third station, instructors Ed Shepard and Sheldon Arey guided new taggers in trying out TB tags and gun applicator tools on fish. TB tags are used on all VGFTP targeted species and are a modified version of the plastic price tags you find in clothing. Annual participation in the VGFTP is limited to 200 anglers who are requested to renew their registration each year. Since 1995, more than 650 recreational anglers have participated in the program, making the VGFTP one of the most successful volunteer tagging programs in the U.S. Primarily funded with revenues from Virginia’s saltwater recreational fishing license, the VGFTP is also supported by the Marine Advisory Services program at VIMS. 250,000: More than 250,000 fishes have been reported since the program’s inception. 28,000 fishes have been recaptured. 2,826 days at large: The longest amount of time a VGFTP tagged fish spent “at large”—or the length of time between tagging and recapture—was a tautog that was originally tagged on April 4, 2004 and was recaptured on January 5, 2012. 337 miles in 53 days is the longest documented northward migration for a VGFTP tagged fish. This flounder was originally tagged at the Chesapeake Bay Bridge Tunnel on November 18, 2007 and was recaptured off of Rhode Island on January 10, 2008. 18,371: This is the highest-ever annual tagging effort for a single species in the VGFTP. In 2012, more than 18,000 red drum were tagged, making it the top-tagged species for the VGFTP that year. 74,539 summer flounder tagged in 20 years: This is the overall total for the top-tagged species in the VGFTP. To learn more about the VGFTP and to find out how to become a tagger, visit www.vims.edu/vgftp. Anglers who catch a fish with a VGFTP tag can report their recaptures online here https://www.vasaltwaterjournal.com/report_tagged_fish.php.